An Architect by training, I live in Shah Alam, Malaysia. A mother of 4 adorable kids. I started painting using watercolor at the age of 6. Moved on to oil painting at 16. I did my Architecture degree and Post Graduate Diploma in Nottingham University, UK. 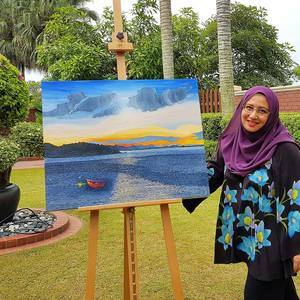 While working as an architect, I continued to paint and had my paintings sold for The Ascott hotel & residency in Kuala Lumpur. My style is impressionism and I love bold colours, strong strokes giving long lasting impression of the scenery or the place. Once in a while I will tilt towards expressionism and experiment on issues which are close to my heart. Post Graduate Diploma in Architecture from Nottingham University, U.K.